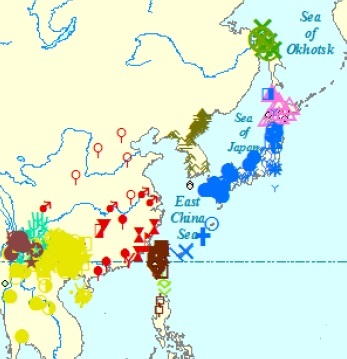 The goal of this study is to compile The Linguistic Atlas of Asia, Vol. 1, which covers all language groups around entire Asia. It comprises approximately 10 items with linguistic maps covering 1,000 locations on vocabulary, phonology, morphology, and syntax, e.g., tone, pitch accent, types of consonant, the mean to count noun whether uses classifier or not, the word order, and other aspects for words such as wind, iron, rice, hand, etc.. Furthermore, the geographical distribution will be interpreted from the viewpoint of linguistic history, language contact, and the transmission of matters as well as the migration of human groups. Research meetings will be held thrice a year, 9 times in total. Each meeting is devoted to one linguistic feature, wherein the geographical distribution and its implication will be discussed. At the same time, presentations on various themes according to each research fellow are to be given. Ultimately, the Atlas with interpretation on each linguistic property is aimed to be published formally in the academic year 2018. Collected papers of meetings and raw data will be openly available online at that time. Principally, all presentations and discussion are conducted in English.